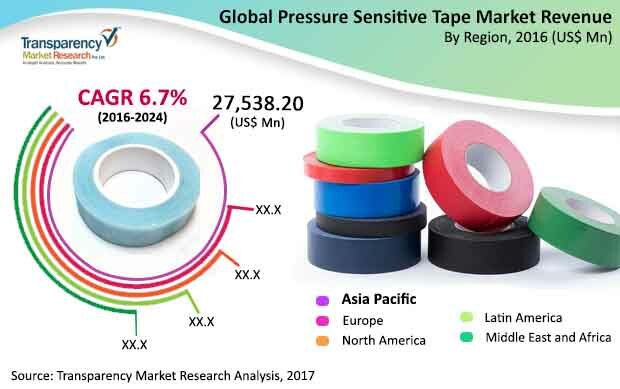 The global pressure sensitive tape market is expected to witness a steady and healthy growth during the forecast period. The market is expected to reach evaluation of US$ 96.1 bn by 2024 end. It is expected to grow at 6.7% CAGR during the forecast period (2017 - 2026). The market evaluation reached US$53.9 bn in 2015. The global pressure sensitive tape is market is driven by a growing demand for various products in electrical insulation, stationery, bonding, labelling, sealing, and packaging. Consumers are also attracted to the pressure sensitive tapes market for new advantages. These advantages include general household applications propelled by growing trend of do-it-yourself popular in certain regions. Advancements in pressure sensitive tape market are also expected to boost market growth during the forecast period. The pressure sensitive tape market offers unique products including specialty, carton sealing tapes, and double-sided and masking tapes. Out of these the carton sealing tapes are expected to drive the market during the forecast period. It secured a majority share in the market, totalling to about 60% in 2015, in the pressure sensitive tape market. The specialty tape is also expected to drive the growth of the market during the forecast period. In terms of value, the specialty tape segment is expected to dominate during the forecast period. The specialty tape segment is driven by the quality of the product and enriching end-user applications. Hence, the segment generally drives higher margins than others and it is expected to grow at a 7.7% CAGR during the forecast period. Based on the packing material used, the global pressure sensitive tape market is divided into paper, polyvinyl chloride, polypropylene and other segments. The market report’s end user segments include automotive, healthcare, electrical, construction, and food and beverages. The pressure sensitive tape market in North America is showing promising signs of growth. Pressure sensitive tapes have advanced to a level where they have replaced mechanical fasteners in many applications. Additionally, the automotive industry is picking up pace much to the delight of the pressure sensitive tape market manufacturers in North America. The pressure sensitive tape market is divided into North America, Europe, Asia Pacific, Latin America, and Middle East & Africa. The pressure sensitive tape market is expected to register a significant growth in Asia Pacific region. Rapid industrialization, growing disposable income, rising population and steady progress in India, China, Vietnam and others is driving the market. The pressure sensitive tape market in Asia Pacific is expected to grow at 7.3% CAGR during the forecast period. Strong manufacturing base in Japan and China can further boost the market growth of the pressure sensitive tape market. The Asia Pacific region is also home to cheap raw materials and several private companies are undertaking technological developments are expected to drive growth of the market during the forecast period.